Got back a few days ago from our annual west coast road trip. We did the drive home in two days. 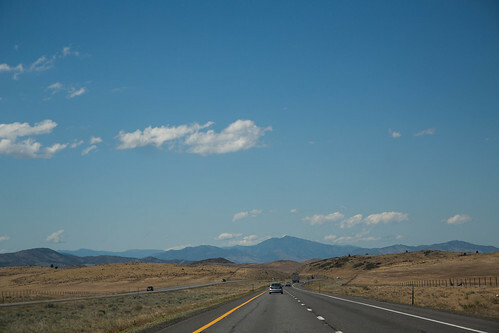 The first morning, driving through the Central Valley, was bright and hot. 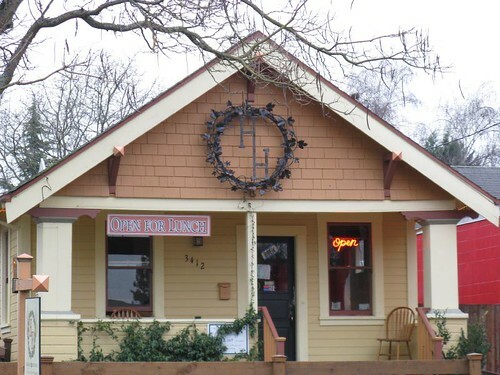 We took a break in Winters, a really charming town we happened upon by chance last year. 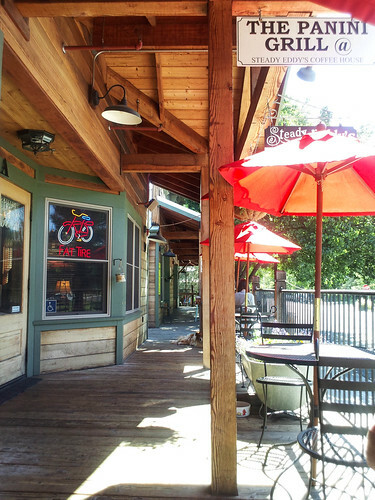 Iced lattes on the deck at Steady Eddy’s fortified us for the next leg. Lunchtime hit as we were passing through Red Bluff. 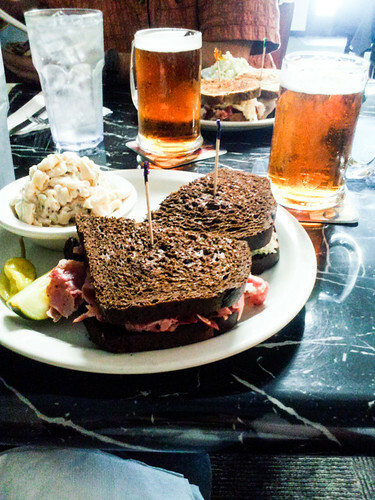 A study of Yelp and Chowhound reviews led us to the Countryside Cafe, which was a slightly strange place but was cool, dark, and had cold beer, really good corned beef sandwiches and macaroni salad. What more do you want during a hot drive? 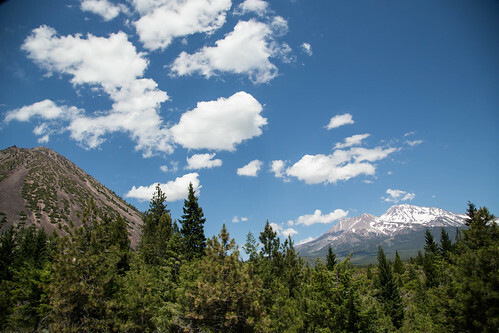 We continued north past Mount Shasta, and felt compelled to stop in Weed for another break. 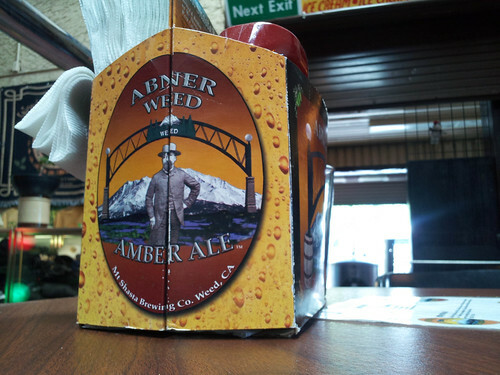 Just like last year, the Weed Alehouse was hot and muggy, but a really interesting place to sit and nurse a good IPA. The heat was enhanced by the fresh tarmac in the parking lot, unfortunately, so you really had to just resign yourself to roasting. Good thing we like their beer. 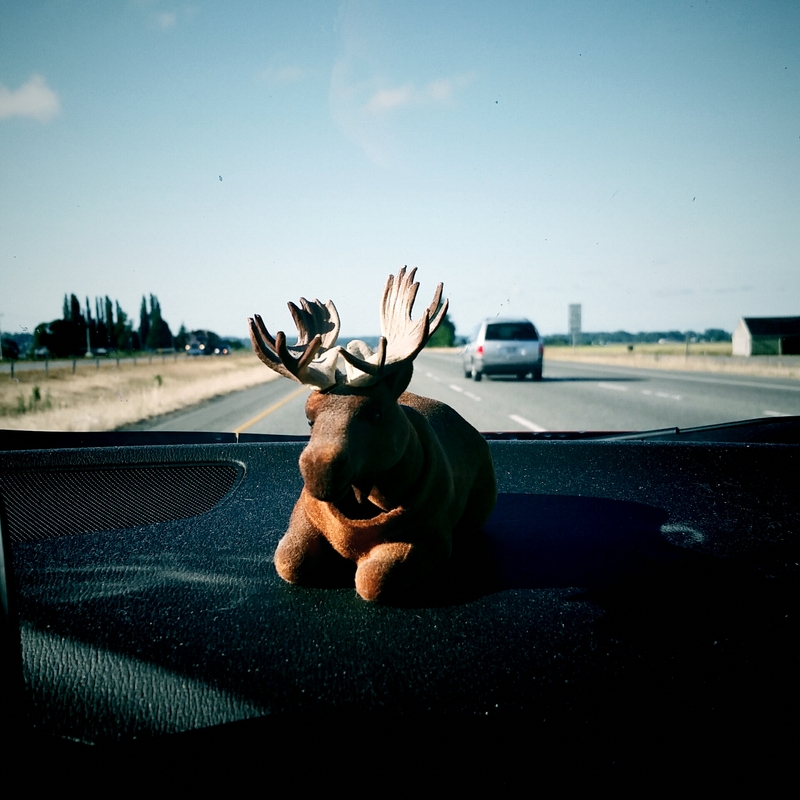 We stopped for the night in Medford, Oregon. 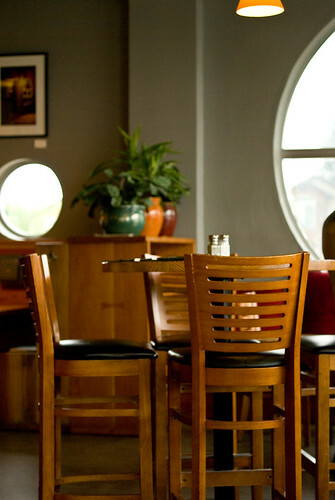 Medford’s a bit of a food wasteland, and we had thought we’d need to drive back to Ashland for dinner, but then we discovered Elements, a tapas restaurant in downtown Medford. Their website said they were closed on Mondays but apparently they just decided not to tell anyone they were open. 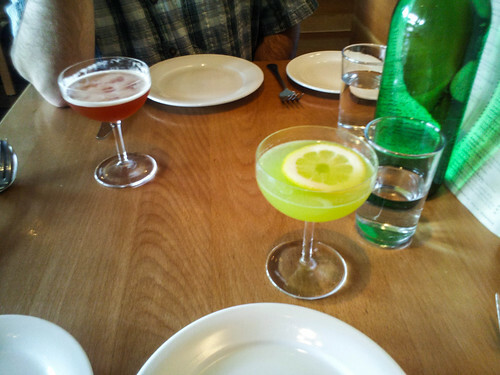 We got some remarkably pleasant cocktails here, including a basil-cucumber gimlet that I liked a lot. 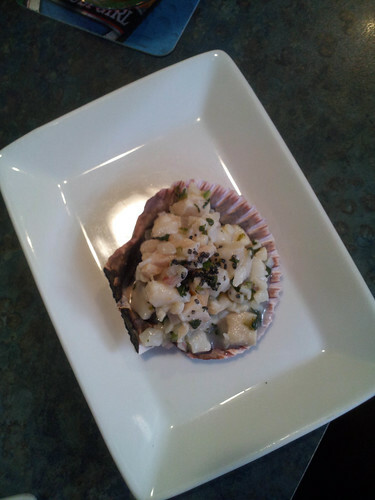 The ceviche was a small portion, cutely served in a scallop shell, and nicely flavored. I liked the black salt on top. 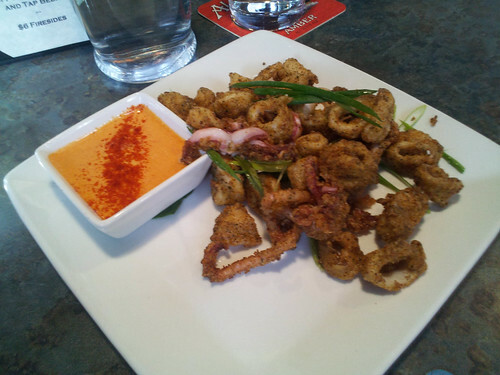 We got the calamari purely by accident – we had been discussing what to order next and the waitress misheard us. 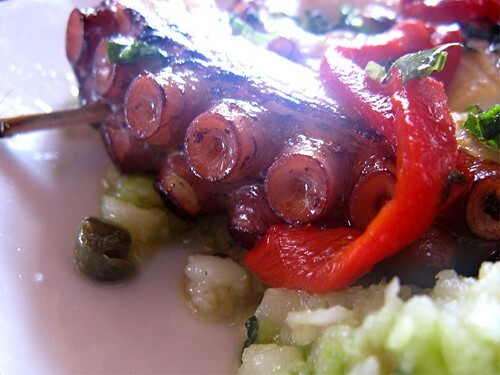 It was a lucky mistake, though, because it was really good – lots of spices on the squid, which was perfectly cooked and not at all rubbery, and a red pepper sauce for dipping. 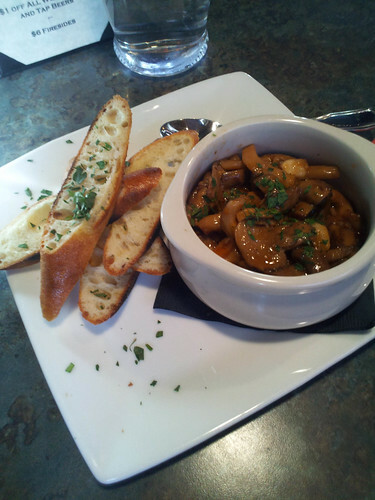 Then there was a small tureen of mixed mushrooms in sauce, also extremely good. 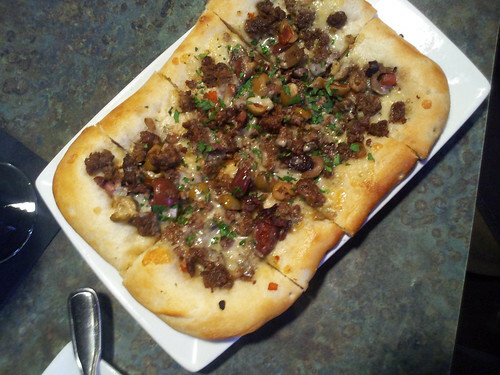 And we finished ourselves off with an order of flatbread topped with lamb, Rogue blue cheese and sharp olives. Very strong flavors and very filling. We took the leftovers back to the motel and I ate them for breakfast, which was perhaps a little odd at 6:30 in the morning, but at least there was Dutch Brothers coffee to wash it down. Our last stop before getting home the next day (unless you count the hour we spent sitting in Seattle-Tacoma traffic) was lunch at the Horse Brass pub in Portland. I’ve been hearing about this place for years but it’s not very handy to where we usually stay, so I’m glad we finally got to try it. 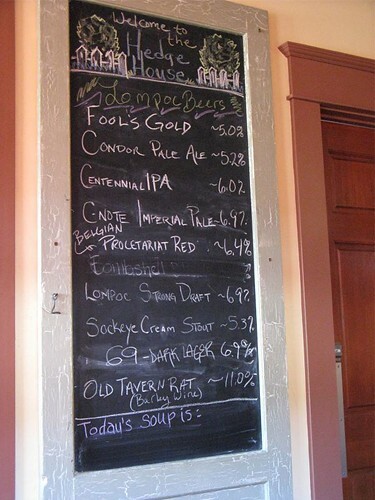 The beer list was astonishing, all the more so since July is Oregon Beer Month and they were featuring local brews of all sorts. I got a Walking Man IPA and Jon got an amazing Velocirapture rye ale from Prodigal Son Brewing, one of the best rye beers I’ve ever tried. I was also able to try a Green Flash pale I’d never seen before but it wasn’t as assertive as I was wanting. 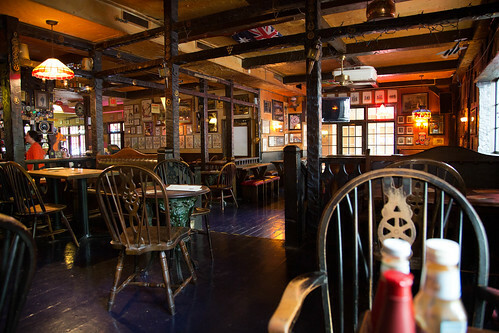 The food at the Horse Brass is straight English pub style, so Jon tried the fish and chips. 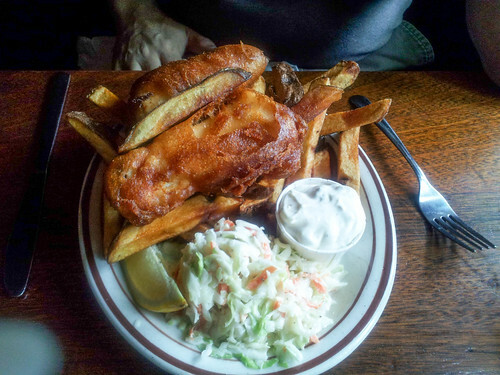 The chips and coleslaw were fine, but the fish was perfect – everything you’d want fried fish to be. The waitress said they’re a little irregular in their quality, so it must have been a good day. 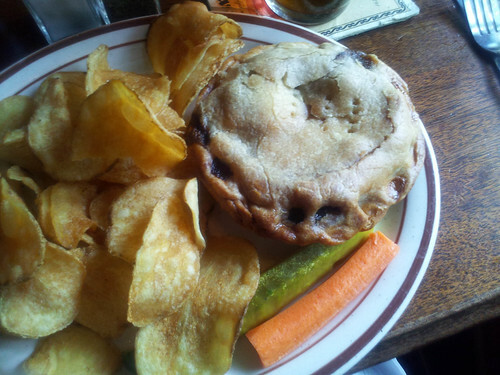 I got a meat pie. It was full of fatty, tender steak and lots of mushrooms, and it was very good in a leaden sort of way, with lots of brown sauce. The potato chips were so delicious I accidentally ate them all. Possibly a good thing, since it took us hours and hours to get home after that. But we made it! We just got back from our yearly summer road trip to California, and it was a doozy! 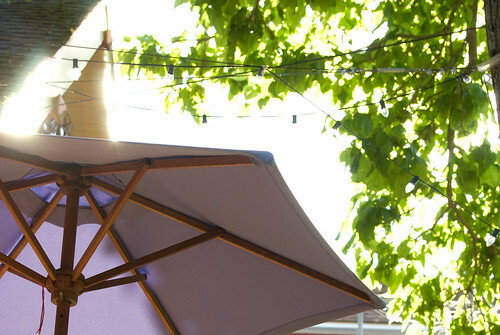 We decided to tack on a couple of extra days at the beginning of our trip and do some serious eating and drinking in Portland before heading down the coast. 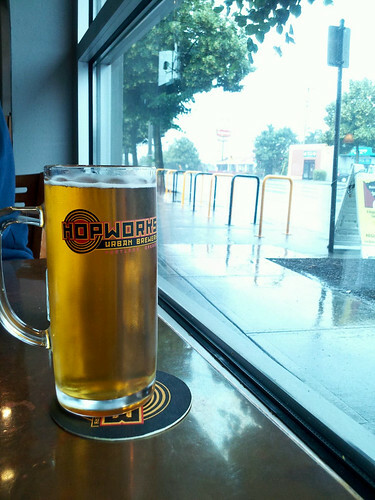 Our first stop when we arrived in town was Hopworks. 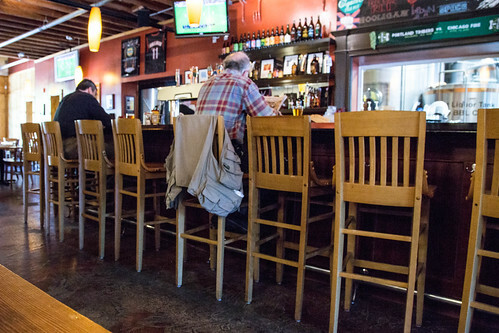 It wasn’t quite as much fun as the last time we were here – they didn’t have any seasonal IPAs and there wasn’t a major soccer game on – but they still beat most brewpubs we’ve been to for amazing beer and food. 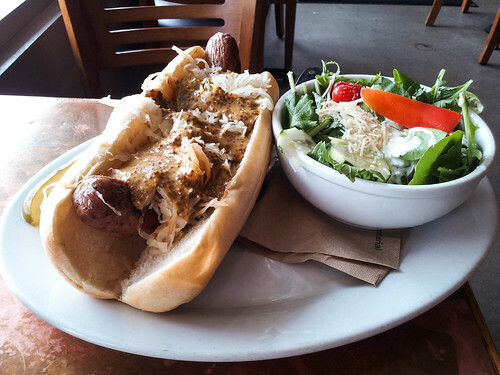 Jon got the sausage sandwich with mustard and kraut and a side salad. 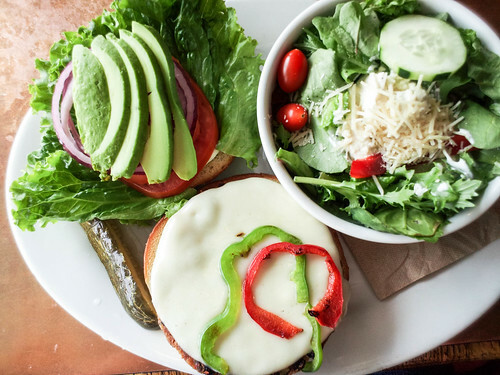 I decided to spring for a veggie burger. I usually avoid these (I may have eaten too many Gardenburgers in the ’90s) but this was a really good one – mostly black beans, topped with lots of tomato and avocado and peppers and cheese. 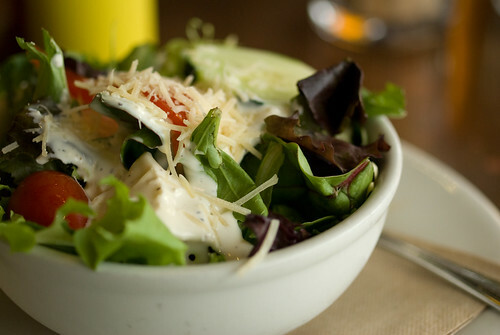 I also got blue cheese dressing on my salad, which at HUB means big chunks of Rogue Blue. It’s so good I may have hurt myself. All that lunch filled us up for quite a while, so we approached dinner with caution. 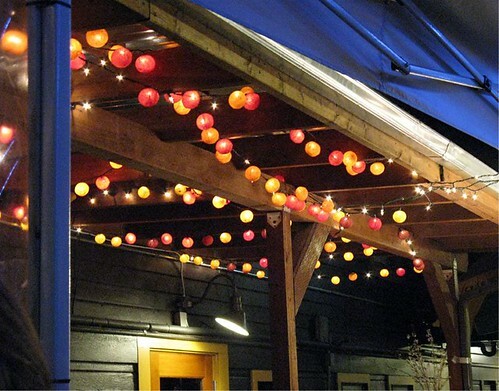 Fortunately the place we like to stay in Portland is right down the street from Pok Pok and its companion hangout, the Whiskey Soda Lounge. We started out at the lounge with cocktails and a couple of plates of Thai-style drinking food. 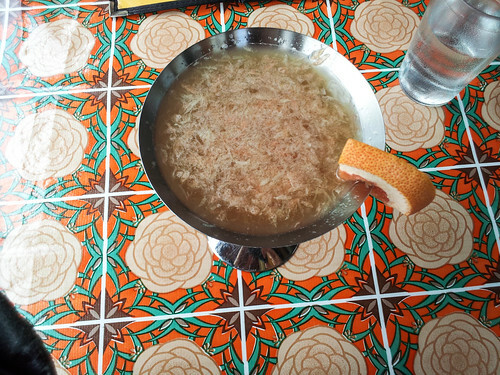 We each tried cocktails made with Pok Pok’s signature drinking vinegars, and they were good. 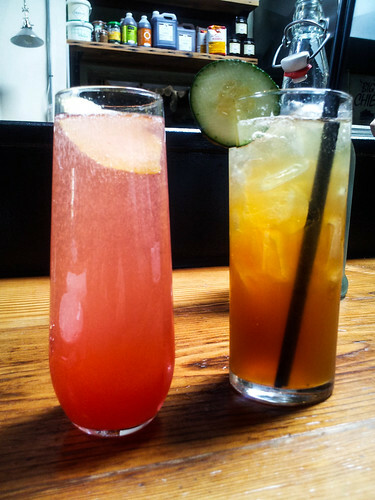 Mine was the “Hunny,” made with tequila, grapefruit juice, lime and honey vinegar. 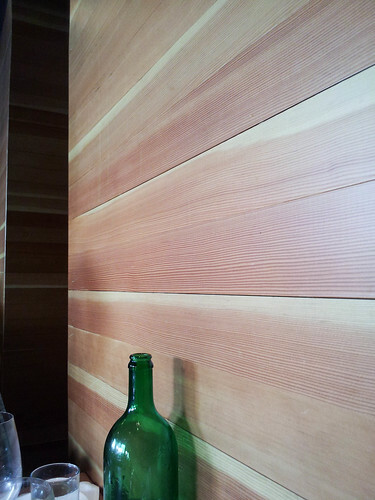 Jon was impressed by the “Stone Fence” which had apple cider, applejack, apple vinegar, and bitters. Amazing new flavors in all of these. We had a hard time picking food to go with our drinks, but we settled on pork riblets. 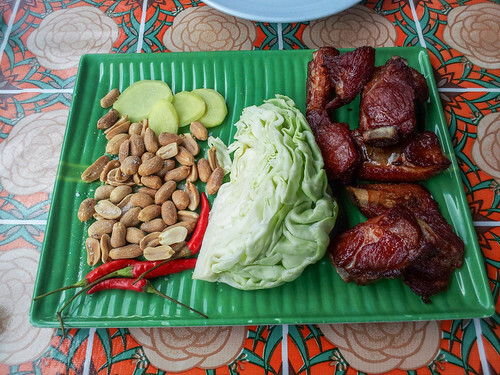 These were sweet and nicely grilled, but oddly came with a large wedge of raw cabbage, as well as some whole raw Thai chiles, sliced fresh ginger and a handful of peanuts. We weren’t sure what the protocol here was so I just tore the cabbage apart with my fingers and we alternated bites of everything (except the chiles – a little of those goes a loooong way). 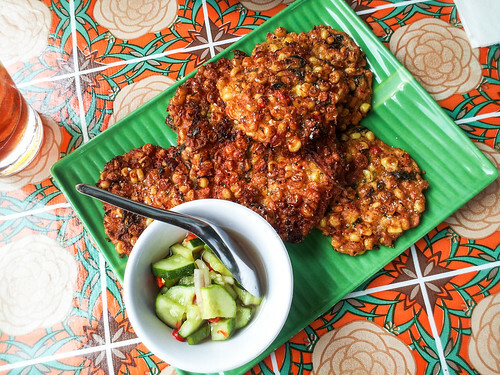 After that we ordered one of the specials: fritters of leftover grilled corn (which was on the Pok Pok dinner menu that week) with chiles and spices. Sweet, smoky, crunchy, hot and fabulous, with a side of cucumbers and green chiles in vinegar. This was almost dinner in itself. 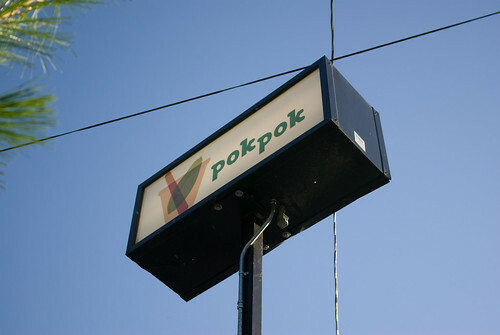 But we still had to go over to Pok Pok afterwards. Much to our surprise, we got a table immediately (I had actually been hoping there would be the usual hour-long wait so we could walk around the neighborhood a bit). 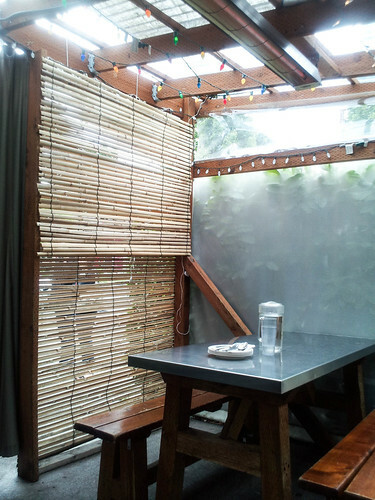 The outdoor dining spaces have been gussied up a little since we first started coming here, but it’s still casual and rustic. 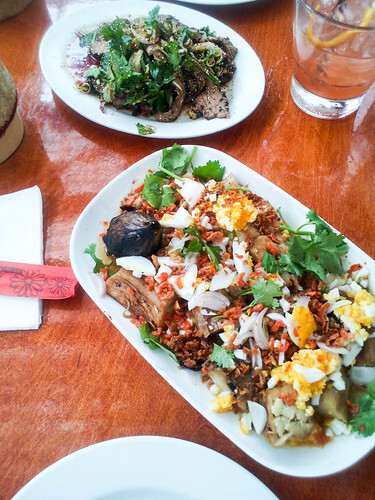 We only got two dishes this time, since we were full of corn fritters: a flank steak salad and a wonderful dish of smoky grilled eggplants covered with dried shrimp, shallots and chopped boiled egg, served with plenty of sticky rice. I would love to make this at home, it was fantastic. 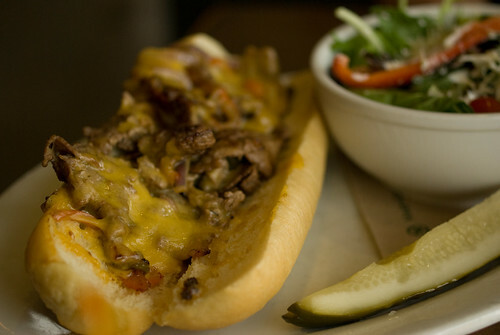 The next morning, after a run to work up our appetites again, we headed to Tasty & Sons for an early lunch. This was every bit as good as I’d heard, plus we had the fun of watching a photojournalist take glamour shots of the food just down the bar from us. Since we were on vacation, we got cocktails: a raspberry-Lillet-sparkling wine concoction for me, and a gin rickey for Jon. We ordered two dishes, which were brought out separately as they were prepared – probably a good thing, since we each might not have shared nicely otherwise. 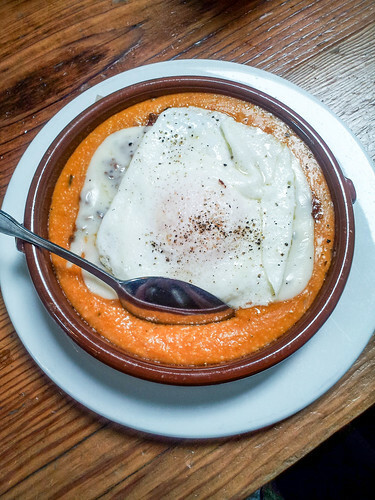 Our first dish was polenta with loads of cheese, sausage ragu, and a runny egg. It was like the best cheesy grits ever. 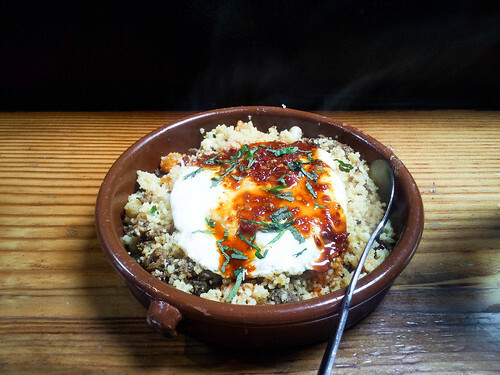 The other dish was couscous with “North African sausage”, roasted cauliflower, another runny egg, harissa, and (to our surprise) lots of dried cherries and apricots. Not as gooey as the other dish, but incredible. 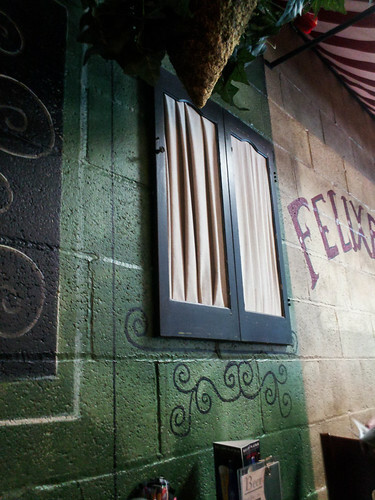 I only regret not being able to try everything on the menu – we’ll just have to wait until we come back to Portland. 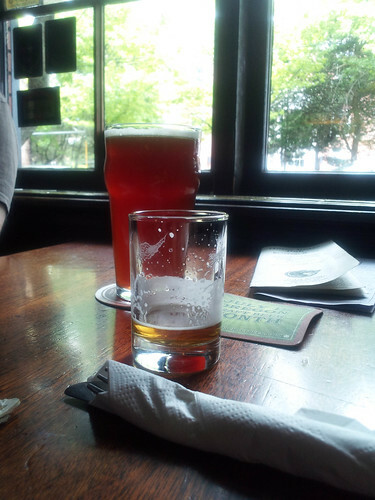 That afternoon we walked on the esplanade, poked around shops, and had a beer at the Laurelwood Brewery (we love their Workhorse IPA but don’t often get to try their other beers), but didn’t feel the need to eat anything for a while – we were saving ourselves for Grüner. Until this trip I hadn’t heard of Grüner at all, but thanks to the magic of Chowhound we made a last-minute decision to have dinner there and managed to snare a reservation. 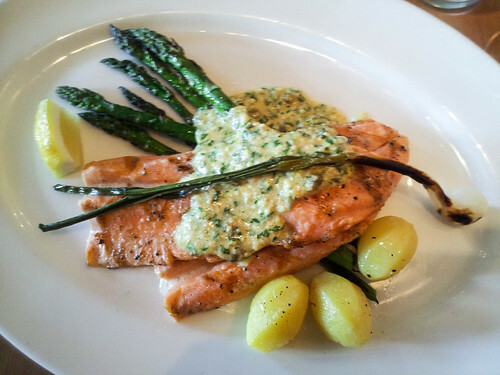 It’s alpine German food, wonderfully seasonal and well-executed. 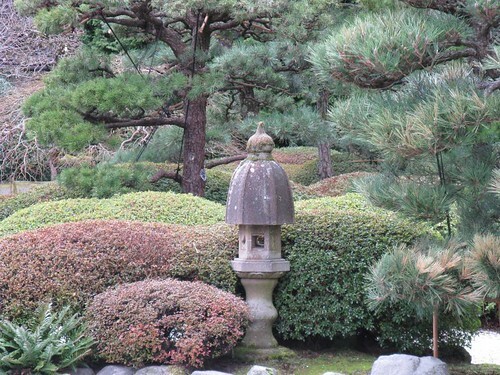 Unfortunately I took really crappy photographs, but it’s still worth showing them to you – sorry about the blur. We started with cocktails, of course. 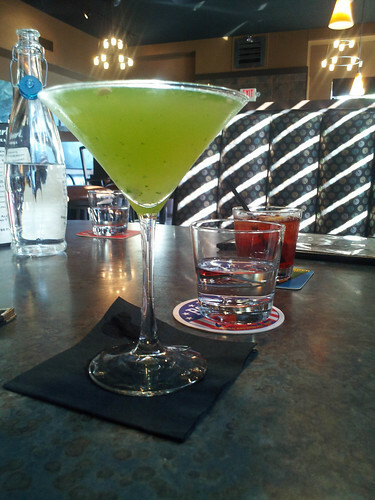 I tried the “Austrian Monk,” which was an unlikely-sounding combo of yellow Chartreuse, gin, celery and lemon. The celery turned out to be a major player here – maybe an extract? I really liked it. Jon got the Albatros which was a bit more fruity than I cared for but it was fun. 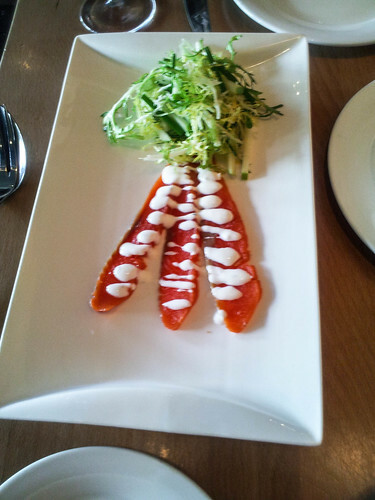 Along with our drink order we asked for a plate of the cured salmon with horseradish cream and frisee with herbs. Nothing could have gone better with the celery flavor of my cocktail, it was perfect. 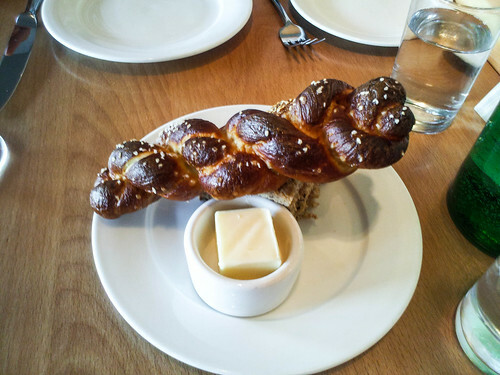 When the bread plate came it turned out to be a perfectly fresh pretzel with lots of salt. Probably the best pretzel I’ve ever eaten. 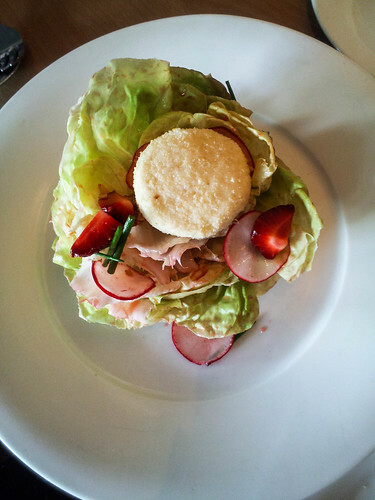 The salad we ordered was recommended by our waiter as being a perfect early summer creation: butter lettuce, radishes, strawberries, walnuts and chevre. It was brought to our table by a trembling server who seemed terrified that the whole concoction would go toppling off the plate, but it was great fun to whack the whole thing in half. And it was incredible to eat – the strawberries were perfectly, absolutely ripe, and the flavors of the fruit, cheese and nuts all worked together. 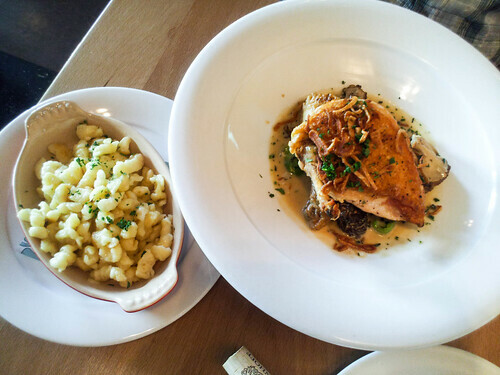 …which was this fantastic Riesling-sauced chicken with morels and favas and quark spaetzle on the side. Damn, this was good. I mean, really good. Wow. 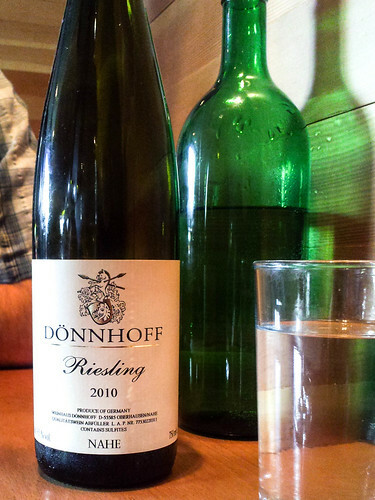 The wine we had with dinner was a very fresh, crisp, low-alcohol Riesling. 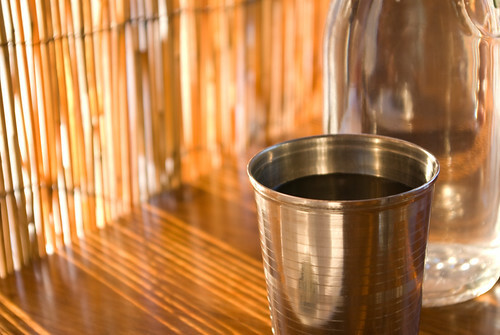 Its faint apple flavor made a nice counterpoint to both our dishes. 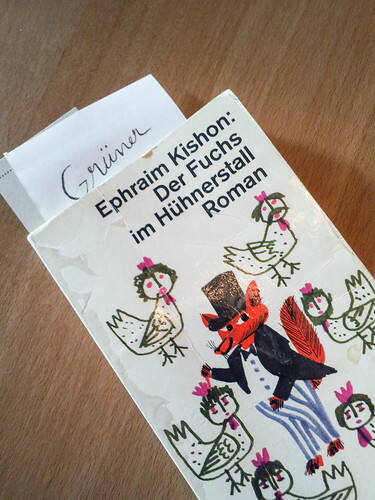 The bill was brought tucked into a strange-looking German novel. I don’t know why. 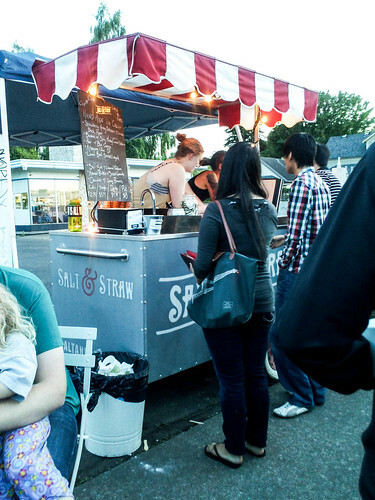 After dinner we drove back to our lodgings, parked the car, then wandered back down Division to the ice cream cart we’d seen set up on the corner, called Salt & Straw. It had been a warm day, and even at 9:30 pm there was a line stretching down the sidewalk. 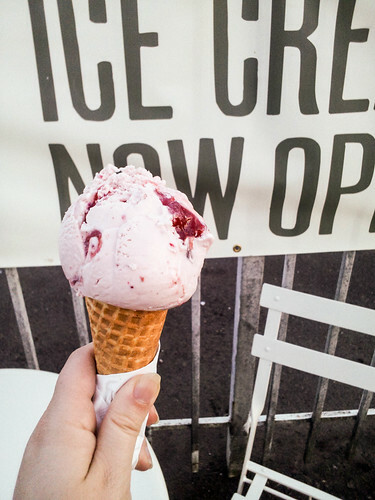 Jon got a scoop of salt ice cream with a caramel ripple, and I had a cone of strawberry-balsamic-black pepper, with enormous swathes of strawberry jam running through it. It made an exciting end to our Portland visit. Next: down the coast to California! 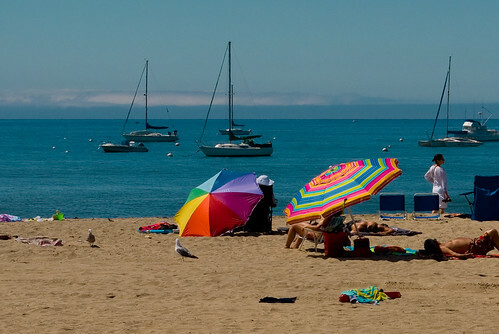 We’ve just begun to recover from our week-long road trip to Santa Cruz to visit my brother-in-law. We spent two days driving south, a few days there, then three days coming back. 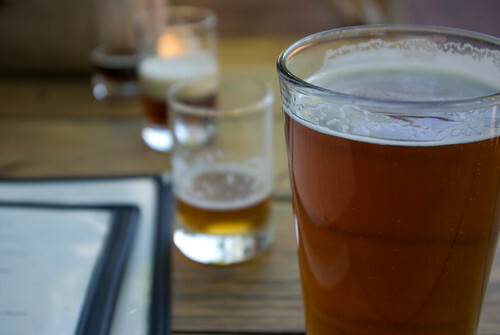 We hit an astounding number of brewpubs along the way. 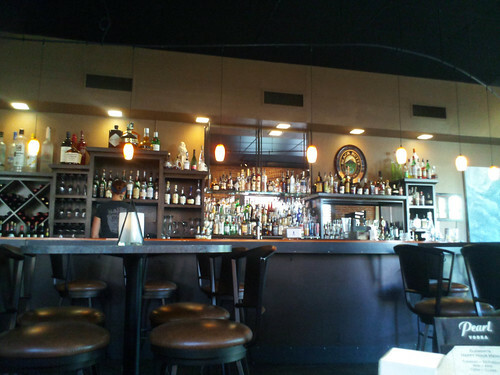 Here’s a (rather long) photo essay of some of the week’s eats and drinks. 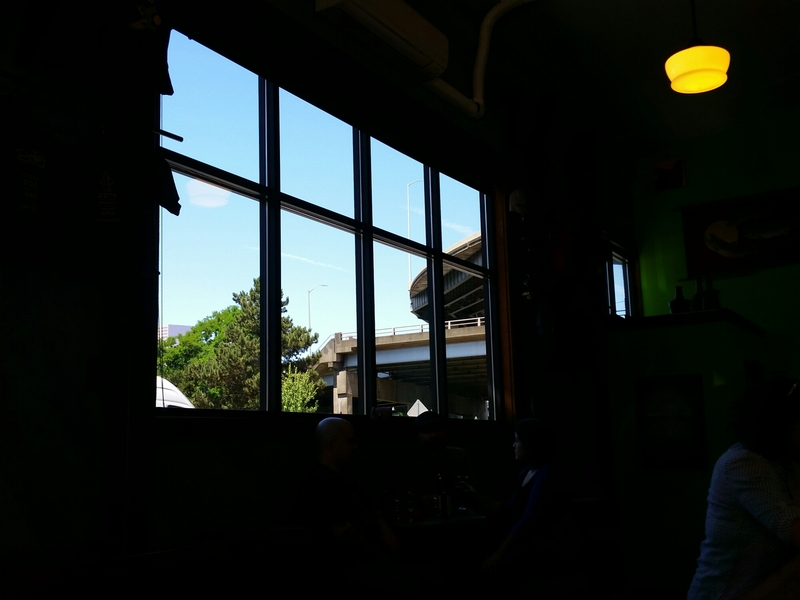 We left Mount Vernon bright and early, with our first stop at Hopworks in Portland. It was pouring down rain (my feet got soaked just going the short distance from the car to the door), but the brewpub was bright and cozy and the Women’s World Cup was just starting. We could happily have stayed there all day, but we dragged ourselves away at halftime. 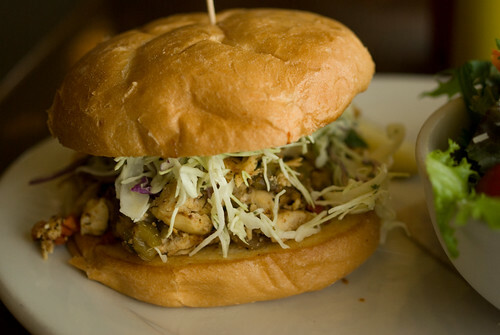 The sandwiches were excellent, especially the chicken ancho, and the salad had chunks of Rogue Creamery blue cheese almost too big to eat. Plus their beer is amazing – I had a pint of Evelyn’s Sunshine Imperial IPA, which was badly needed after our drive through the storm. We got out of town last week and took the train down to Portland for a little vacation, just in time for a massive heat wave. 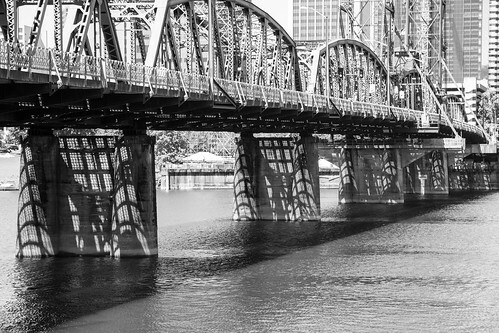 Despite broken-down buses (one overheated and died on the Burnside Bridge – fun! ), blisters, short tempers and heat exhaustion, we managed to have a great time and eat quite a lot of food. 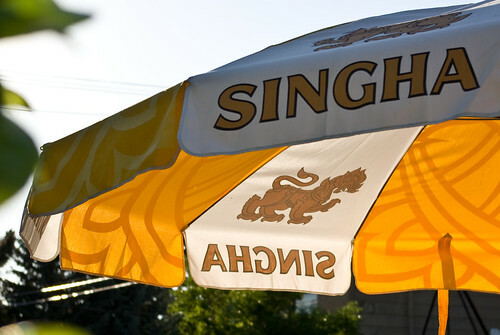 Also, it was an excellent weekend for sitting in the shade drinking beer, so we made sure to do plenty of that. We started at the Hedge House. After our dinner at Sel Gris the night before, we didn’t really feel up to much on our last morning in Portland. I snagged coffee and a bagel from the guesthouse kitchen, then we staggered up the street to Haven for a little extra caffeine and sugar. Sitting in the sun with the Sunday funnies and a cup of hot chocolate was about the right speed. Afterwards, somewhat fortified, we boldly found what I believe to be one of the fastest (and maybe stupidest) routes up Mount Tabor, an extinct volcano that sits at the east end of the Hawthorne district and is covered with roads and paths of all sorts. We weren’t sure where the road started, so instead we found a trail and went straight up. 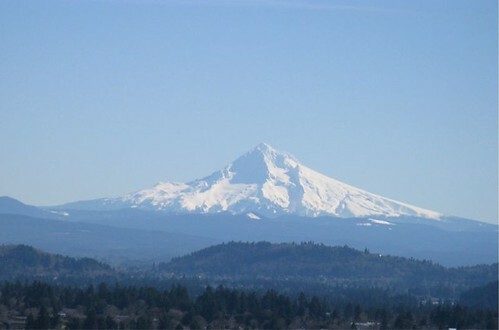 It was a gorgeous day, and the view was fantastic, with both Mount Hood and Mount Saint Helens out in the sun. A full day of walking and eating in Portland! We started out with coffee at our most excellent guesthouse, then headed down the street to the highly recommended Detour Cafe. After our last visit to Portland, we figured any good breakfast place would be crammed full of people on a sunny Saturday morning, but there were plenty of free tables. 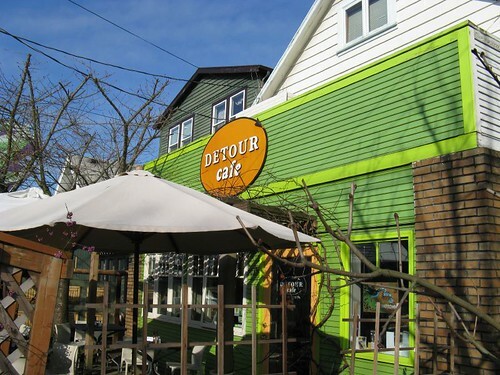 The Detour’s a great place – sunny, colorful, and casual. Good coffee, of course (it is Portland, after all). Then menu isn’t huge, but it looked like they had some good stuff – we both got breakfast sandwiches, and were very happy with them. 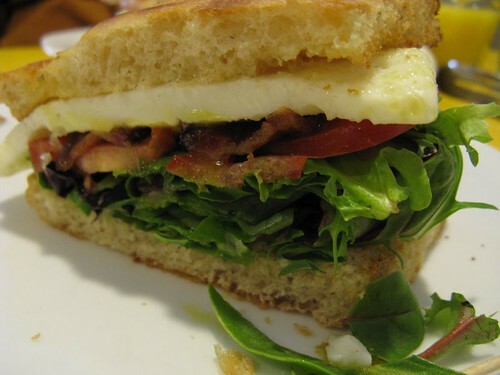 Mine had a fried egg, mixed salad greens, bacon and fresh tomato on foccaccia – my dream breakfast sandwich, really. 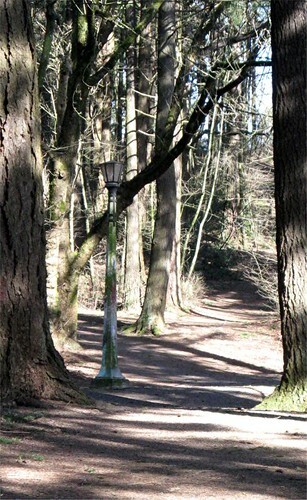 It reminded me of one I had in Tofino, on Vancouver Island, and have remembered fondly ever since. We amused ourselves this weekend by taking the train down to Portland. 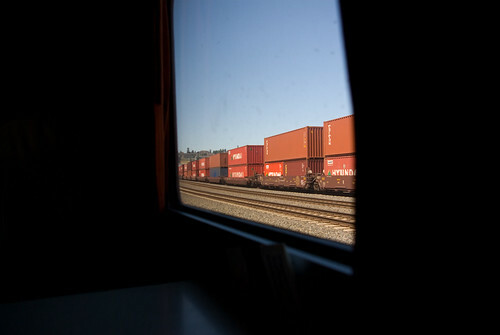 It’s a great way to go: the train goes right along the coast, so the scenery is wonderful. You don’t have to deal with I-5 traffic, and Portland has a very good public transportation system and is very walkable. 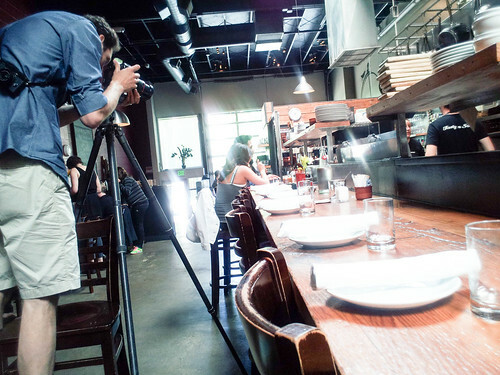 And the food scene there is just amazing. We spent three days and barely scratched the surface. The train has a bistro car, but we usually prefer to bring a lunch along. 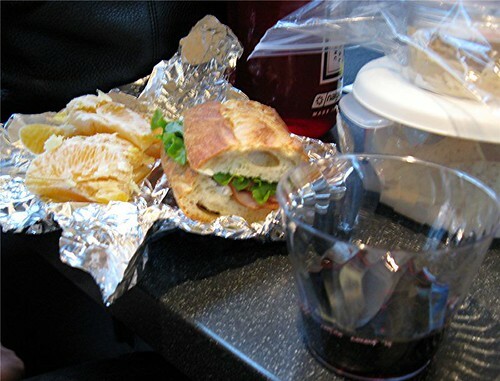 For this trip, J made sandwiches out of a baguette and some ham, with brie and fresh basil. We had leftovers of a truly splendid bottle of wine, a Sones petite syrah from the central coast of California, so we brought that along as well. The train was so full that it was a little awkward to eat – we felt like we should have brought enough for everyone. Ah, well.